Australia based Cromwell Property Group lodge their prospectus to go ahead and list their portfolio of European properties on the SGX as Cromwell European REIT (CEREIT). Cromwell Property is in the business of owning real estate for capital growth and rental income in Australia. They are also in the fund management space, managing portfolios acquired from time to time as unlisted wholesale property funds. From time to time they divest the properties in these funds so that their investors in these property funds can exit and realize their gains. Or they sell off the whole portfolio to one of the highest bidder. Not too long ago, they engaged Goldman Sachs to mull a listing in Singapore. 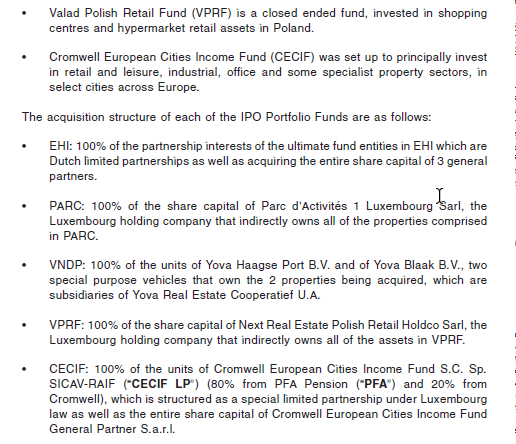 It looks like they will go ahead and we will have our first REIT denominated in Euros. The REIT will most likely priced between EUR 0.55 to EUR 0.57. How does this REIT look? This portfolio is big. Mapletree Logistic Trust is S$ 5.6 bil in Assets. 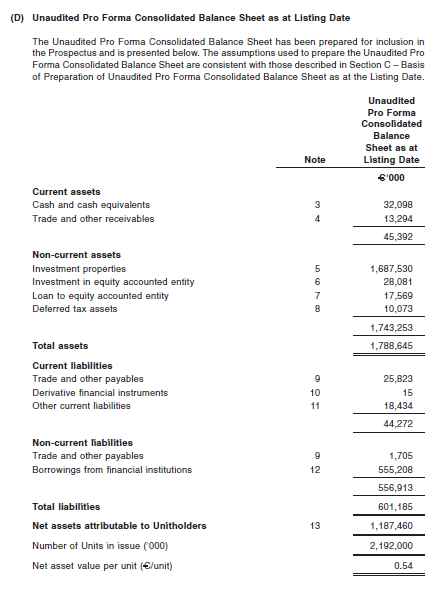 FLT is S$ 1.7 mil in Assets. 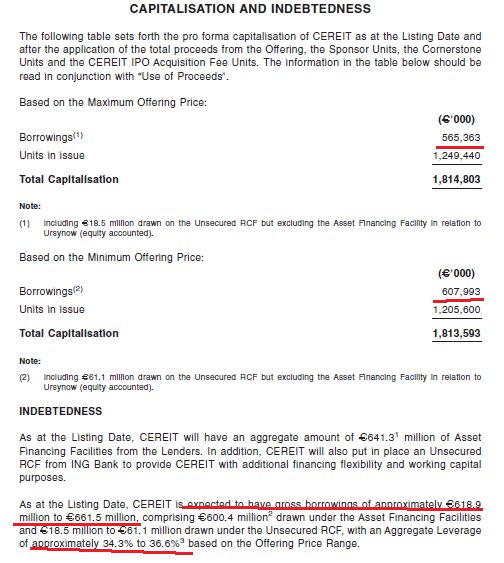 CEREIT is almost S$2.9 bil in Assets. There is 81 properties here. 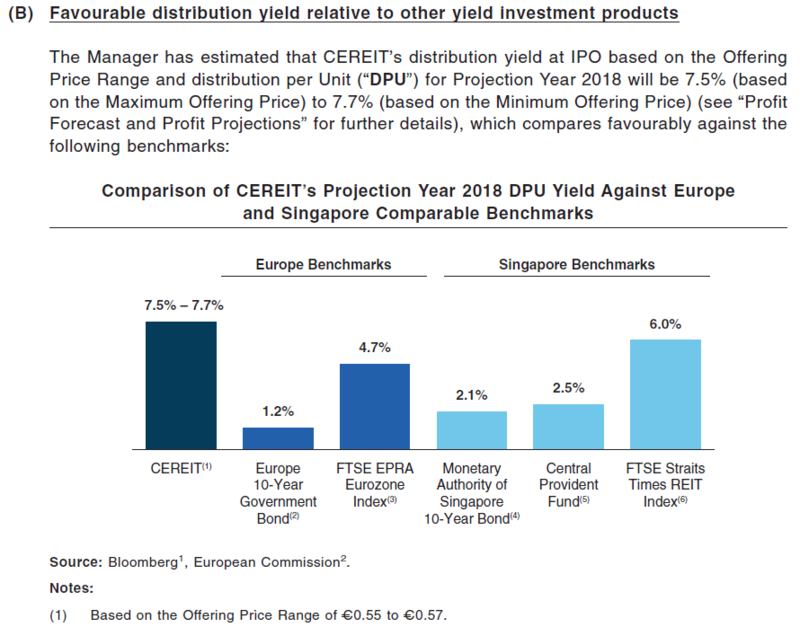 In short, CEREIT has an attractive dividend yield, a diversified profile of assets in Europe, across different property segment, across unconcentrated tenants. The leverage is medium. You are exposed to currency risk, just like you are exposed to currency risk in other REITs with overseas properties regardless whether you list it in Singapore or in which currency. Cromwell Property is looking to unwind, so don’t expect this to be cheap in the grand scheme of things. This is my tear down in detail. CE REIT provides investors with a very attractive dividend yield. This so if you compare against the popular dividend stocks and REITs on my Dividend Stock Tracker. 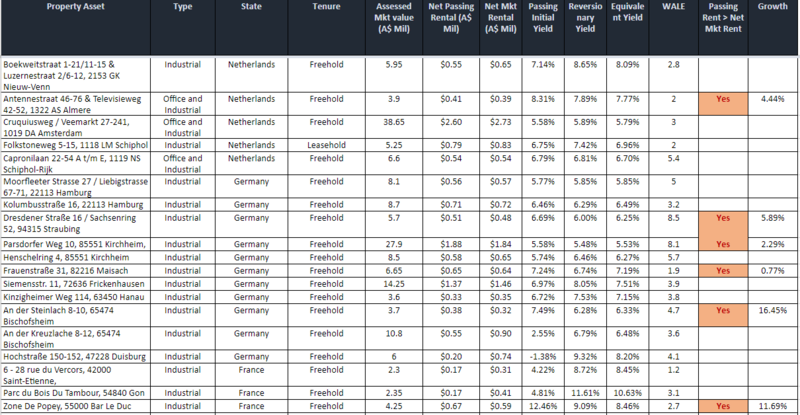 More so that this yield is achieved on a net debt to asset of nearly 29%. However, dividend yield is only one side of the equation. An attractive dividend yield can be shaved if the average currency exchange of Euro versus SGD will be 2% lower in the next 10 years. 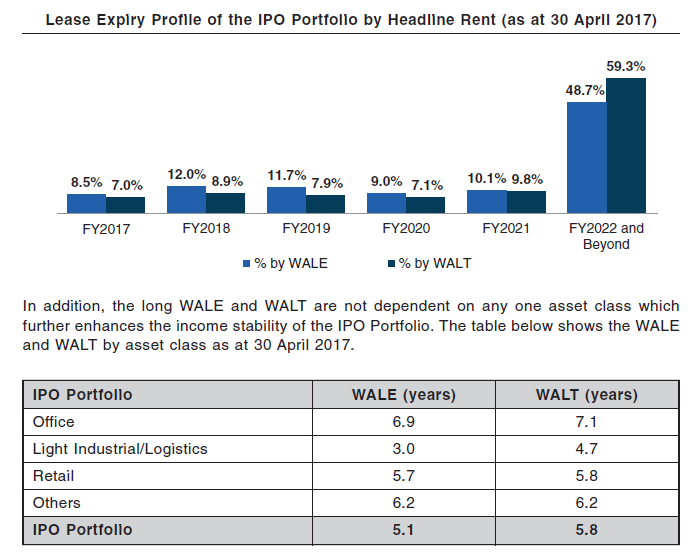 While the WALE and WALT for the portfolio is long, its weakness lies in that most of the build in rental escalation is consumer price index (CPI) based. They will be in a similar situation as IREIT and Parkway Life REIT where if there is high inflation, you will good organic dividend growth. However, it is hard to anticipate that happening in the current economic climate in the region. This is in contrast to the fixed rental escalation of 2-3%/yr from Manulife US REIT and FLT. 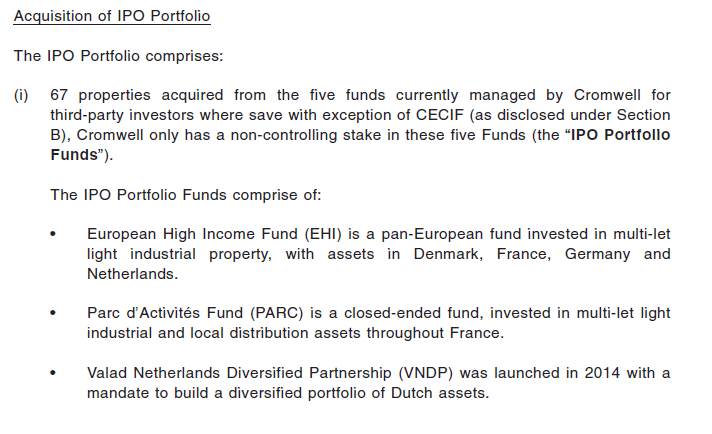 CE REIT’s portfolio is very diversified across Europe. The marketing material makes sure we understand that its diversified across 1000 leases and top 10 tenants contributes only 40% of total headline rent. CE REIT is exposed to the advantage and disadvantage of the economies in various countries. Would it be better to stay in one good economy or spread it out? Or are the economies very correlated? In a certain sense, they might face the advantage and disadvantage that their fate are pretty tied together since they are all in the European Union. If this is true, then there is less diversification across country. It may be like investing in a REIT with many properties in USA. We are just diversified across different states. Similar to other listed overseas REIT such as Frasers Logistics & Industrial Trust (FLT), Manulife US REIT, IREIT Global, the land ownership is freehold. This reduces the risk that eventually the REIT will have to find ways of funding to renew the land, if the land can be renewed. Freehold doesn’t mean that the buildings do not wear and tear, and we should expect the REIT manager to use capital from time to time to renovate and asset enhance existing properties. After all, tenants are like us, we prefer to work, or go to a place that do not sap our morale. Working in a old environment would do that to most people. 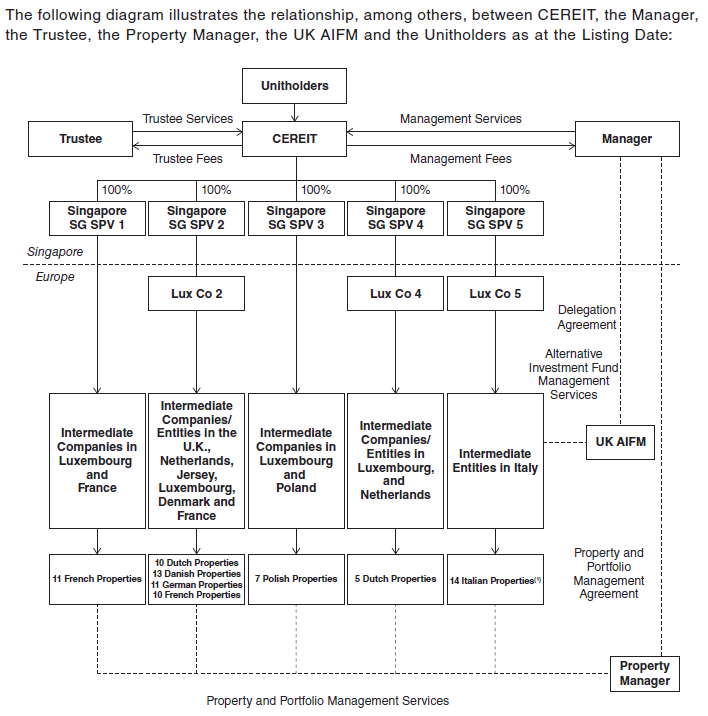 The above is a proforma of the balance sheet of CE REIT. Depending on how it goes, the total debt will be EUR 555 mil, with cash of EUR 32 mil. 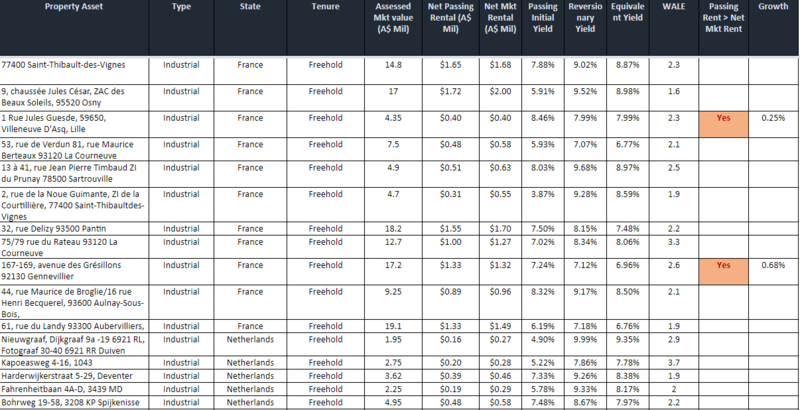 The net debt to total assets will be 29%. Yet in another section, the prospectus state that the aggregate leverage is much higher at 34% to 36%. If we take 619 mil / 1788 mil in assets we arrive at 34%. Net of debt of 33%. This is slightly more than the level of gearing when Frasers Logistics & Industrial Trust listed. And its much lower than IREIT Global (39%) with the same dividend yield. A lower gearing will enable the REIT to risk manage better (however that is just one permutation) but also allow the REIT to have more future funding options. It also means the REIT have the bandwidth to grow, if its able to find ways to grow. The prospectus is 1100 pages and a large part of it contains information on the individual properties that is bundled in this IPO. The valuation report lists the passing rent, which is what the property currently rents for. The equivalent rent, which is somewhere between the passing and reversion rent, taking into consideration rents rising (or falling) from current rent to the estimated rent. It takes into consideration rent reviews, costs and void periods. The first thing we observe is that the aggregate passing rent yield is less than the equivalent rent yield. This means that as an aggregate, the portfolio has the potential to rise in yield. However, this is not by a lot. The highest yielding areas tend to be where the portfolio have the lowest amount of assets. The high yielding areas are France and Denmark. Their passing rent is also below the market rent. 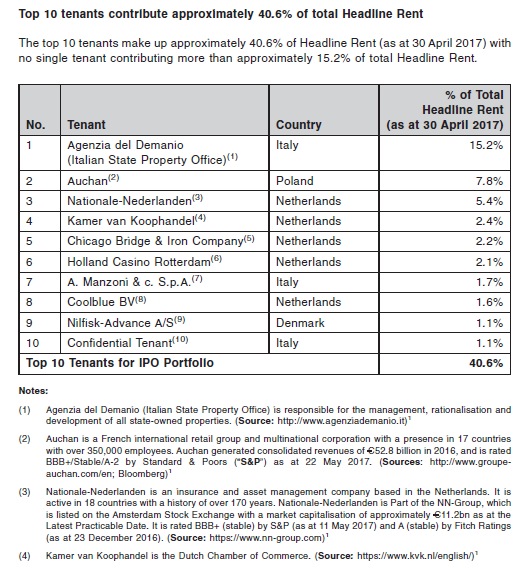 2 of the highest composition areas, Italy and Poland, on average have passing rents that are higher than market rent. 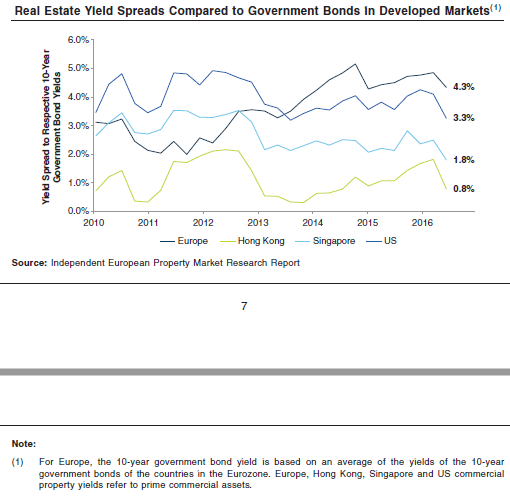 From the table we can see the passing rental yield to be lower than the reversionary rental yield. In no way does this table highlight the quality or the lack of quality of the tenants. You can refer to the table after this article for a summary of the asset’s rental data. You can also contrast the 6.2% cap rate to that of Frasers Logistics Industrial Trust when it listed last year. Their freehold cap rate in Australia was 6.8% with a WALE of 8 years. Not an apple to apple comparison but nevertheless. One of the ways we judge if a REIT is overvalued or undervalued is its spread from the risk free rate. If the spread is wider than historical average, there is a likelihood the assets are trading out of sync with the traditional assets risk versus reward bands. They might revert to the average. The same is also true of the inverse if the spread is narrower. When we compare against Singapore, the yield spread of Singapore have narrowed over the past 6-7 years. In contrast Europe has widen. In recent times, almost all yield spreads have dipped, which might mean perhaps its time to wait for a while to purchase! The market could use some reversion back to the mean. 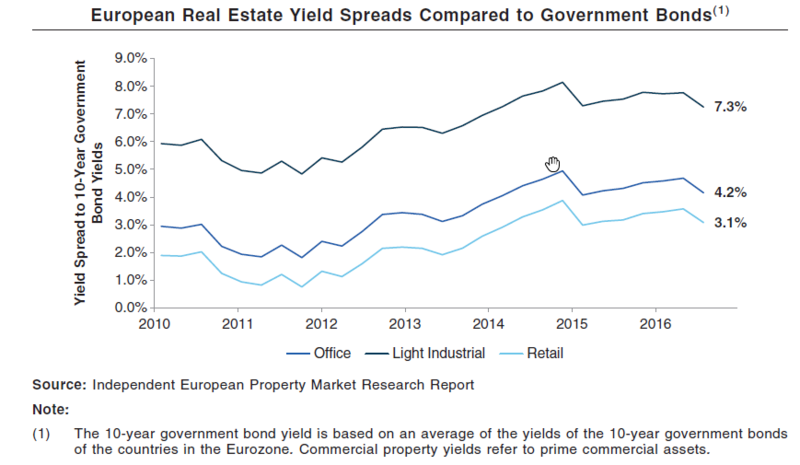 If we look at the individual property segments, the light industrial offers some crazy yield spreads over the government bonds. The Office spread at 4% looks good as well. When your leases are spread out, it is as if you have formed your own bond ladder. If the economic situation is volatile, you will not suffer from a period where your properties are expiring when there is excessive supply. However, you will also not benefit from the luck during a period of excessive demand. In CEREIT’s case, the WALE is very well spread out over the years. This, together with the 1000 leases, across a few countries, should smooth out the volatility in rents. The way to look at this is that 7.5-7.7% might not be the dividend yield you will get. The 10 year yield can be that figure, lower or higher. However the long term dividend yield should be more stable. The table above gave us some clues on the WALE of each country. Here is my estimation of the WALE of each country. Looks pretty close! 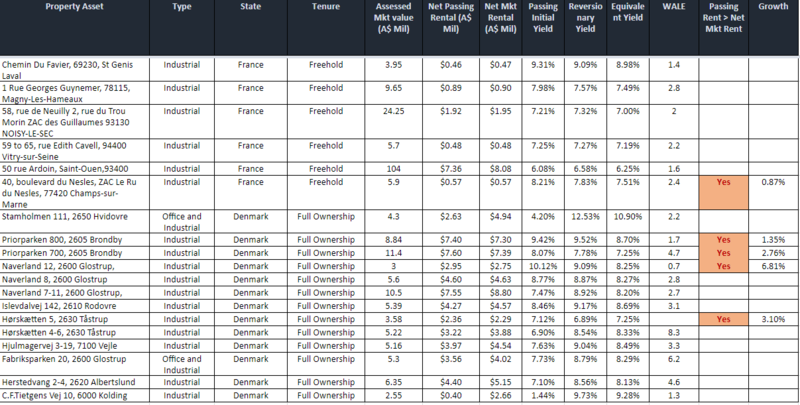 While Industrial in Denmark and France are high yielding, their WALE may be pretty short. Vacancy and Rental volatility may be higher and requires more expertise to manage. In fact, if you look at page 22 to 31 of the prospectus, you will notice those properties in Denmark and France are much shorter than 3 years. One of the key criteria I highlighted in my REIT Training Center, is to invest in REITs where the economic outlook is good. Good economic outlook, demand for work, demand for office and industrial space, demand for retail. The inverse is not good. 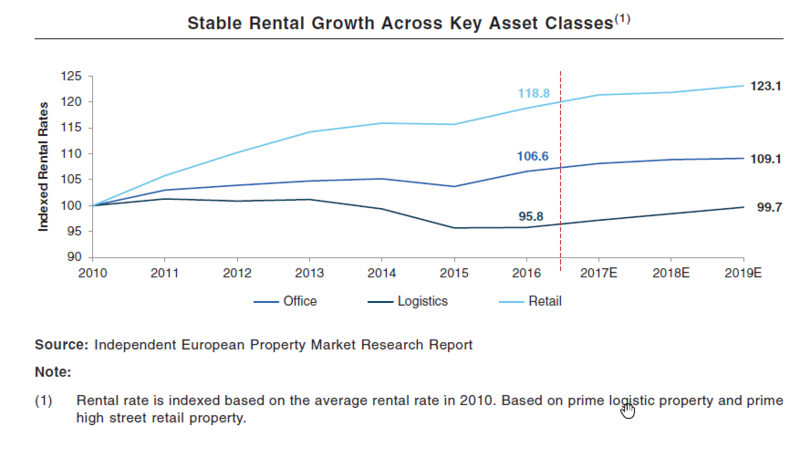 Europe have been plague by slow growth for the past years, and this independent research shows positive uptrend for the retail rental and stable for the office and industrial. Particularly, while industrial yield spreads look attractive, they are more susceptible to the economic situation. Note the decline from 2010 to 2015. The REIT might be able to take rental declines but vacancy is another matter. 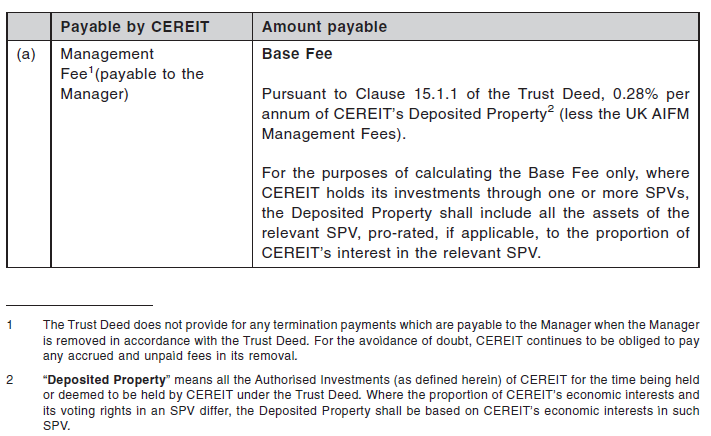 CEREIT will have at least SG$1.5 bil in market capitalization. This is a state that its competitors IREIT, FLT and Manulife would like to reach. With a larger market capitalization, institution investors can then take them seriously and hold them. This usually is when they get into particular index. Their size might make them much more well supported. CE REIT will eventually be looking to have 2,192 mil units. However, only 78 to 79 mil units will be on offer to the Singapore public. 2 cornerstone investors will take up a little more than 15% of the units. The sponsor, Cromwell Property Group in Australia will take up another 15% odd. Depending on how this goes, the sponsors will not own more than 20%. If I am right, there is no rules such as that in the USA that if an entity owns more than 10% of the REIT, its taxation advantage will be compromised. In this way, dividends received from foreign entity are not subjected to corporate taxation or dividend withholding taxes. The management usually charges a base fee, a performance fee and acquisition and divestment fee. The base fee to me, looks pretty normal. 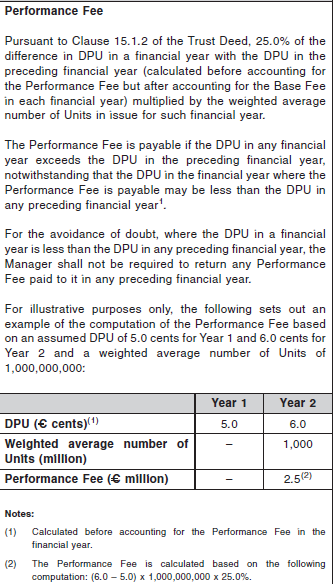 The performance fee is pegged to the performance of Dividends per unit. 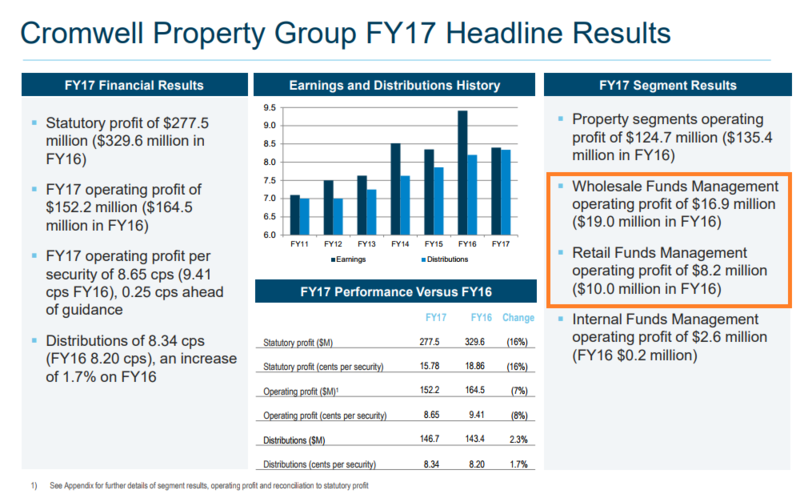 This I feel aligns the interest since other REITs used net property income or distributable income growth which can be increase by rights issues, debts and placement but overall might result in DPU going down. The dynamics to manage can require the management to be rather skillful. This is one of the concerns brought up in an IREIT EGM when they wanted to acquire other type of properties. I do not see management to be much different. Cromwell acquired this portfolio in 2015, and likely the same group of property managers and REIT management personnel will be managing it. A change from an unlisted fund, or whole sale fund to a listed REIT is likely not going to change how the REIT will be manage. However, I should note that Cromwell have installed Phillip Levinson to be the CEO of CEREIT. 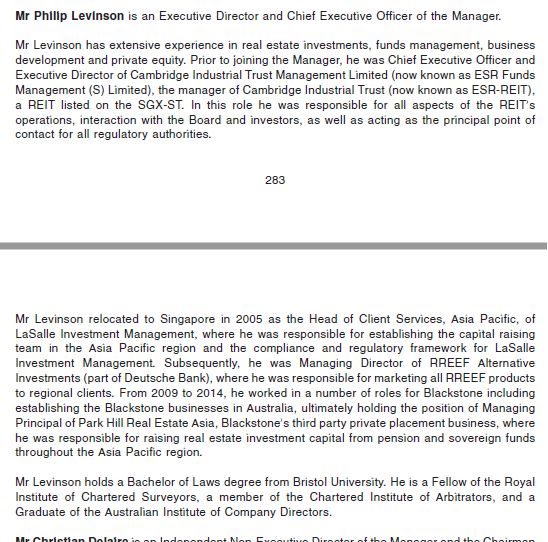 Mr Levinson managed Cambridge REIT from 2014 till recently. It is a period which they did relatively ok. In the prospectus, Cromwell Property provided an idea where the acquisition came from. From the looks of it, this IPO may be the way for investors of closed end fund to realized their returns. Typically, property funds, such as those seeded and managed by ARA asset management have a fixed tenure of roughly 7 years. When marketed, these funds target a high internal rate of return (IRR). If its too low, investors will not invest in the first place. So when it comes time to sell out, managers like Cromwell need to satisfy this IRR hurdle. This means that they will look for the most attractive sellers. This tends to be private equity or some rich sovereign buyers. If their portfolio is not attractive, or there are no good prospective buyers, the manager sells to their own REITs or list it. Is this the case? we are not sure. We can take a look through its history. In the prospectus for the IPO, the manager provided a summary of Cromwell Europe’s history. The whole entity started off with Teesland group listed on LSE. In 2004 they acquired iO Group for 200 mil pounds. Valad Property Group, based in Australia acquired Teesland iO Group in 2007. What follows was the great financial crisis and Valad Property Group did not have a great time. In 2011, alternative asset and distressed buyer Blackstone group purchase Valad group for US$ 165 mil. That is probably the price they paid for the asset management firm. The value of Valad group then was US$134 mil. Turns out the share price fell a lot. Blackstone probably got a really good deal here. Even in 2011, the share price fall from above $2.50 to below $1.50. 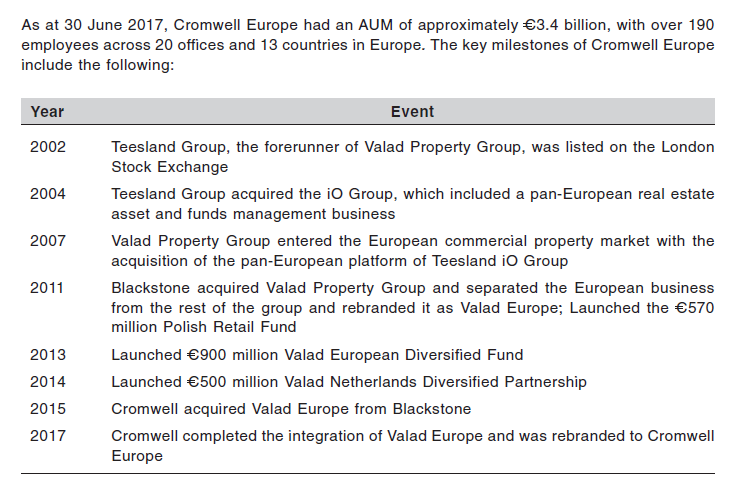 In 2015, Cromwell in turned, purchase Valad Europe from Blackstone. The purchase price is EUR 145 mil or US$174 mil. This does not look much higher than Blackstone’s purchase, until i remember Blackstone purchase the entire Valad. Did this acquisition work out well for Cromwell Property Group? From their FY 17 results presentation, the funds management could do with some boost. In an Australian publication on the lead up to the Singapore listings, it looks like they have to write down part of the goodwill. This means the asset potential turns out to be less than when they purchase it. 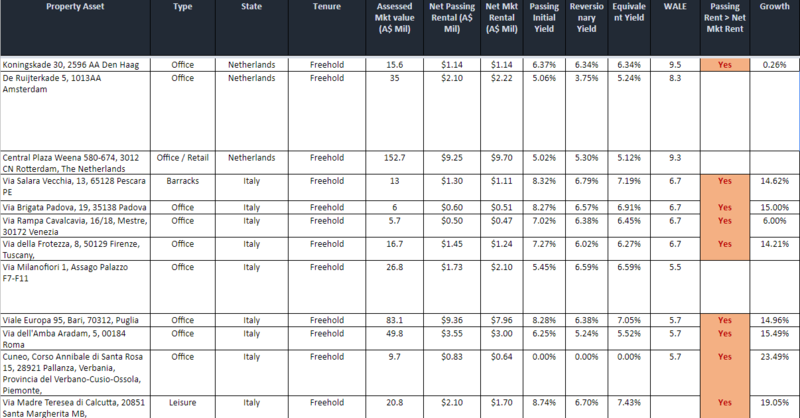 Listing this REIT could help recover some of these losses. Sustainable REIT Investing requires us to build up our competency. You need to see what makes the most impact when it comes to identifying REITs to deploy your cash for the long term. You also need to understand some of the nuances that will only be revealed to you if you study the REIT as a subject in detail. Check out the latest Dividend Yield of Popular Singapore Dividend Stocks, including your REITs, Business Trust here on My Dividend Stock Tracker. The following are the details of the properties included in the REIT. I see! Thanks for the prompt reply! I do think its fundamentals are quite attractive – like a much more diversed and larger IREIT (which you are still holding alot) with lower gearing. Main unknown for me is the management’s track record. However, I assess that its portfolio will likely remain stable which could be a good thing since it is already so large. Don’t think there is much left to acquire from the sponsor? 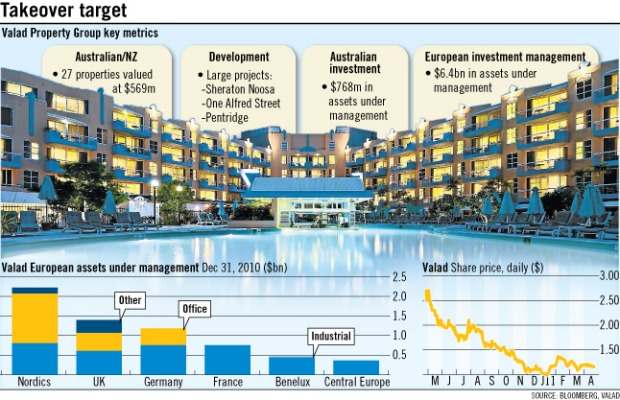 From what i learn from Australian friends that are investing, Cromwell is not a top tier property manager. Their portfolios tend to be a mixture which makes me wonder how do you manage a diverse property portfolio. The property managers will likely not change. The status of the properties and ownership changes but in truth how much difference will that be? It is more of their competency to risk manage the capital and their motivation. At this point likely i will not subscribe but that will change if I uncover more information. Thanks for the review. Saved me time from trawling through the prospectus. Thanks Kyith . You saved us a lot of time and effort with your valuable inputs. Will wait and see. Hello Kyith: What is NAV of CEREIT? thank you so much for the info on NAV. Australian Financial Review has given a negative commentary on the IPO: high management fees, include three assets from Cromwell’s own balance sheet (why?) 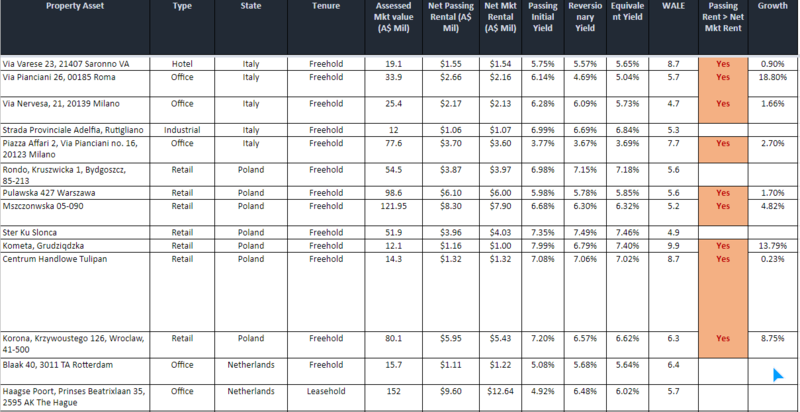 into the trust, portfolio has more than 10% vacancy, bulk of assets is split between Poland, Netherlands, Italy -all of which are reasonably illiquid markets with smaller exposures in Germany, Denmark, France.Things have often not gone well for Aust managed fund in Europe.No one in Aust sector will forget fund mgr APN Property’s unhappy exit from Europe 6 yrs ago which left investors in its Europe retail trust with just a pittance after commercial real estate value crashed. Perhaps the folks in SG don’t know that story. (extract from Edge) .For sharing. Hi obk, I am aware of some of the commentary of Cromwell in Australian Times and AFR, but unfortunately I did not come across this article. Thanks for highlight this to me. You are welcome. 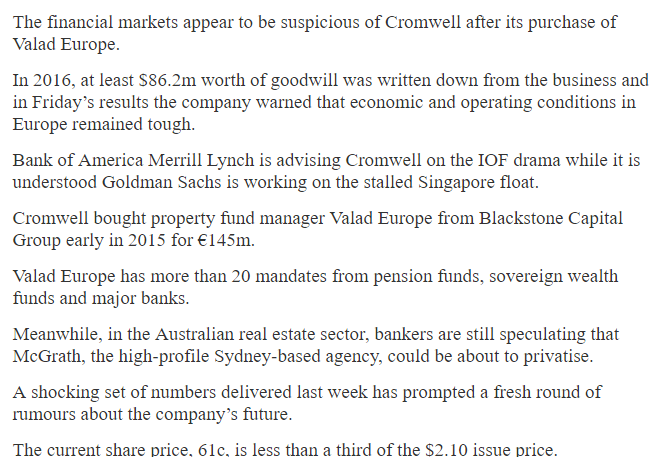 Any updates and comments by Cromwell on the AFR’s article. I think its up for us to decide whether this deal benefits the shareholders or more the sponsors. If we cannot sense well, we stay on the sidelines. One good case study is that of Manulife REIT. WE have no idea why they would come so far to list it in our shores and we were initially skeptical. Right now the price is high, but we realize they might have a quality portfolio and ok management. 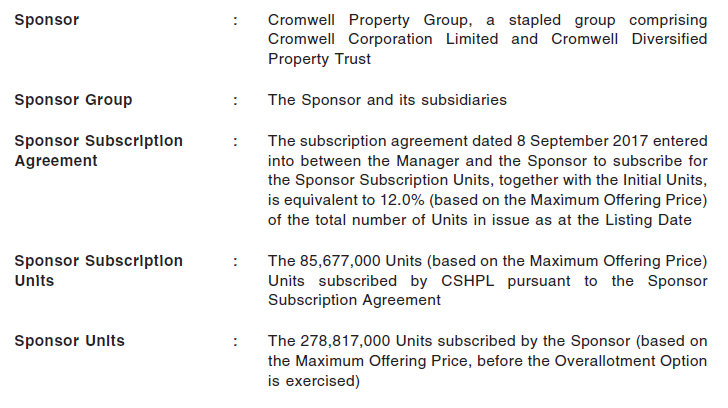 I think the IPO benefits Cromwell more than the would be shareholders. More negative report as Cromwell faces credit rating downgrade from Moody’s. Moody’s is reviewing for a downgrade on the property group’s Baa3 issuer rating & downgrade on Baa2 senior secured ratings of Cromwell Property Securities Ltd. Note: Baa3 is the lowest investment-grade credit rating & implies a moderate risk. Cromwell also recently entered into a new short-term loan facilities to fund a stake and may be a higher stake in CEREIT. due to not so good demand by the big boys. I will give this Reit a miss. HI Boon Kheng, that is in the news recently. Thanks for highlighting this here. At times, we have to look at the uniqueness of this portfolio without the problems of the people selling it. If someone is selling a residential condo in downtown Orchard for $700,000, you question why they are doing it, but at times it might really be a bargain. I am not saying this is such a case. If a company is in tight credit spot and need to raise cash, by selling off some of their assets that they otherwise do not want to sell off, the assets might be good deals. However, the part of this that I am paying attention more is why aren’t the big boys biting. I agree with you that we should now focus on why the big boys are not biting. No reasons were given the Reit for reducing the offer size or Cromwell taking up a greater stake than initially planned. We can guess and so what is your take? not mentioned much but usually they would want the institution to take a larger stake. We can only guess why they come to singapore. We are yield hungry.